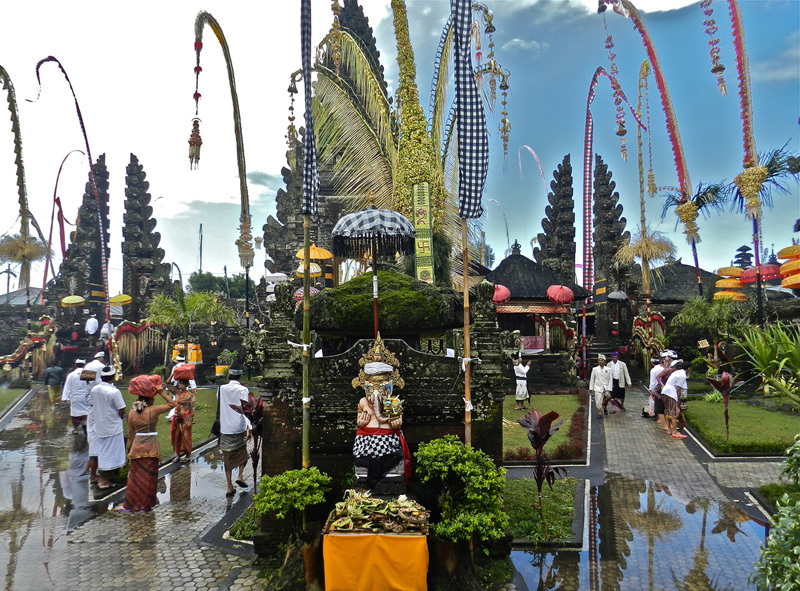 Nyepi is the first day of the Balinese New Year and is a day of silence. This year it was a few days before we arrived. 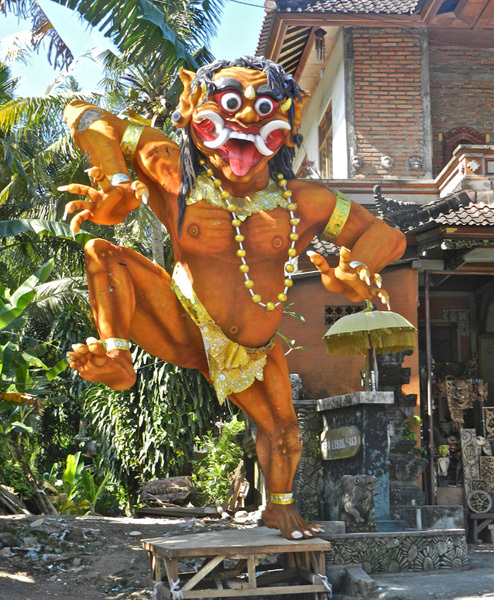 About a month before Nyepi each community starts to make their Ogoh-ogoh. 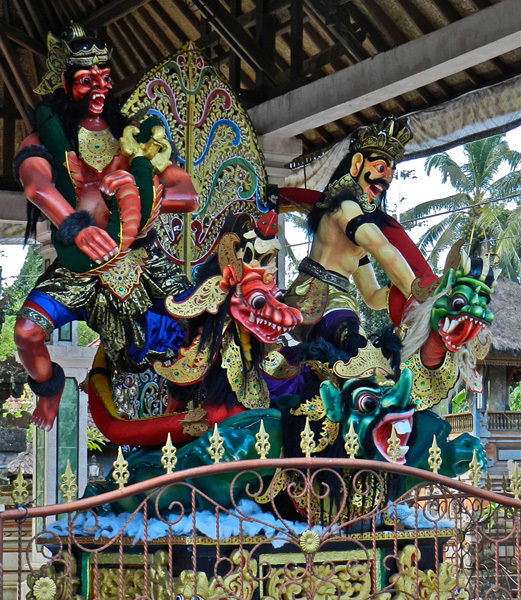 They are large demonic statues made from a bamboo structure and covered in papier-mache. The day before Nyepi they are paraded through the streets and then burnt in a huge fire amid drumming and dancing and shouting “Get out! 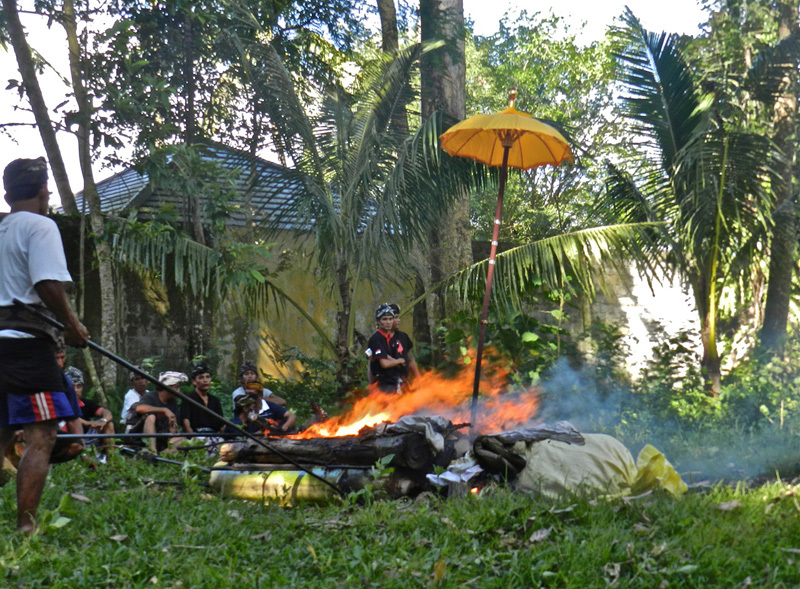 Get out!” as a purification ceremony to drive out demons and bad spirits. Lucky for us not all of them were burnt so we got to see some of these amazing creations. 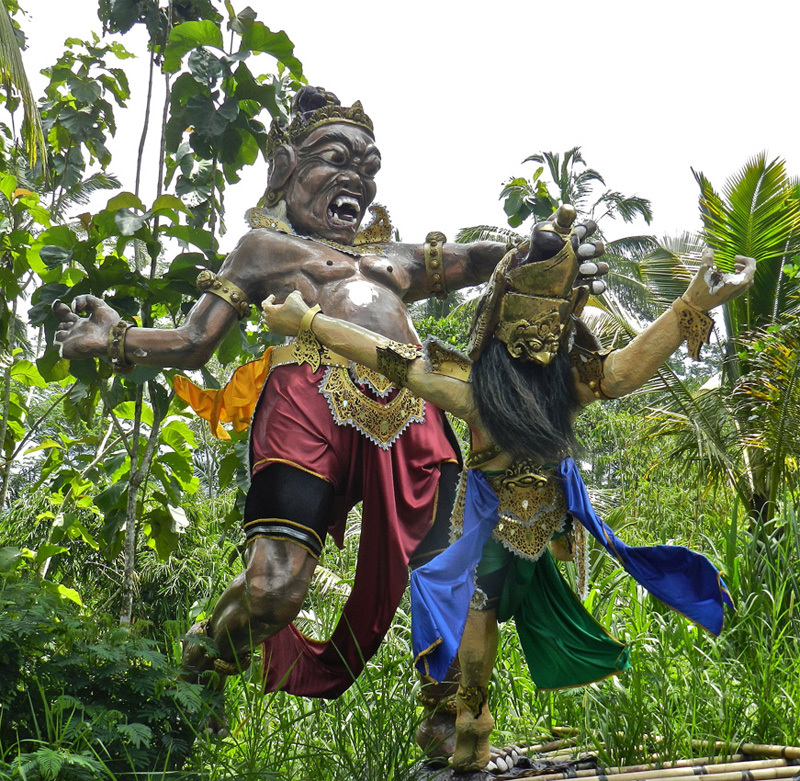 Driving around Bali we would stop every time we saw one – exclaiming in wonder at the creativity and fierceness of them. 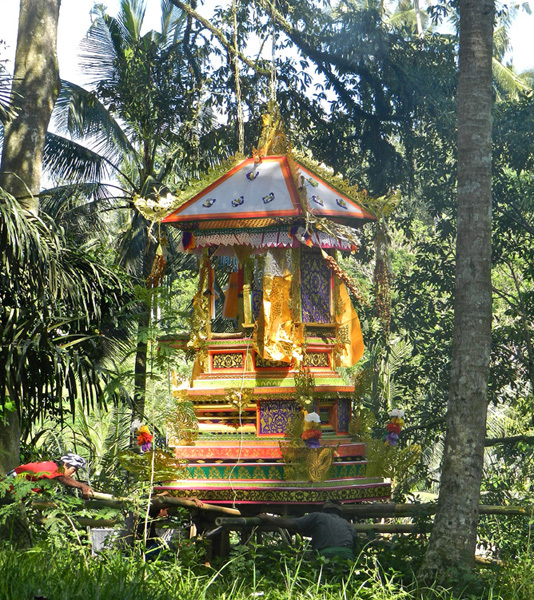 And impressed with the Balinese sensibility that in an energetically powerful way that fully exposes and confronts all that they would choose to not have in their lives, they do all they can to rid themselves of it through prayer, through commitment, and through huge colourful noisy ceremony and ritual. No hair shirts or desperate prayers in a little church for these people. They do their religion, and ceremony on a grand scale, giving it a life and power that is not seen elsewhere, at least not in my somewhat limited experience. They shout out loudly “this is what we don’t want and we’ll do all we can to not have it!” At the same time they honour, in daily ritual and prayer and offerings, all that they do want, all that is cherished and held dear – peace and harmony and caring. 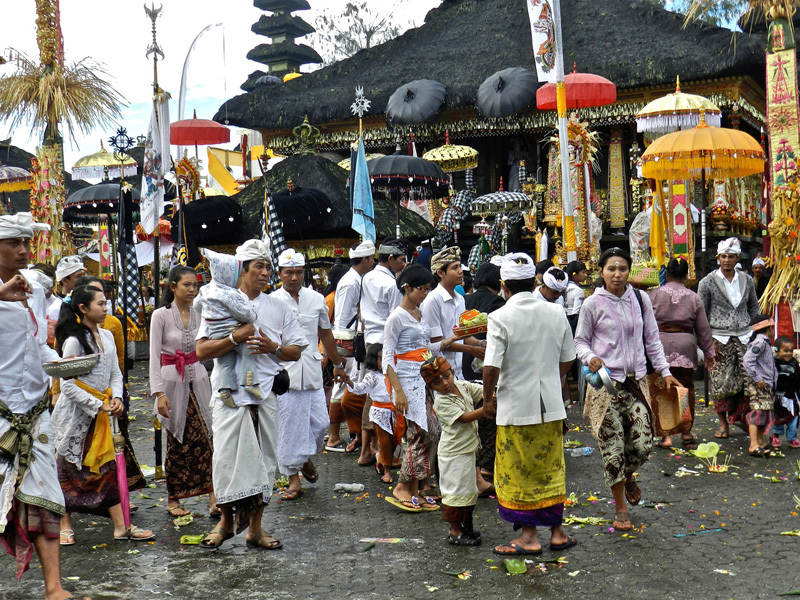 It’s not that the Balinese have a perfect society, and we’ve been warned by the Balinese themselves to be wary of theft when in big crowds – people are as people everywhere – it’s that there is constant acceptance of the existence of the opposing forces of good and evil and that through daily prayer and ritual, and less frequent major ceremonies they seem to be committed to doing all they can to emphasize and encourage the positive aspects of being. 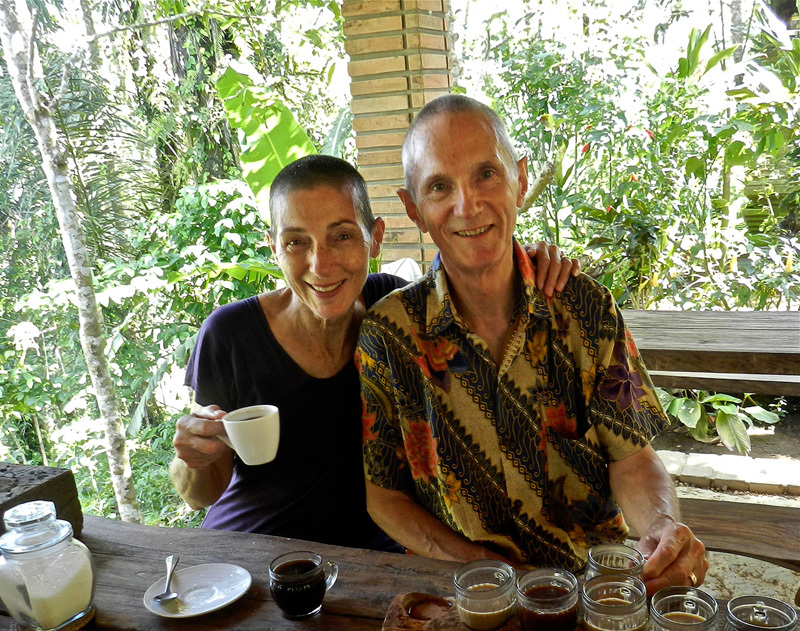 A drive north one day – to a coffee plantation where they make civet coffee. The coffee comes from the slightly fermented, but still whole and un-shelled coffee beans found in the poo of civet cats which are related to the mongoose. The nocturnal civets like to eat the best of the red coffee berries. And the farmers like to collect their poo the next morning, wash out all the undigested coffee beans, shell them and roast them by hand to make what is supposed to be the smoothest coffee in the world. Don says the coffee grounds smell slightly of cat pee. I had a cup. Side by side with a cup of regular coffee. I use so much sugar in my coffee I couldn’t really tell the difference. Beautiful view though. 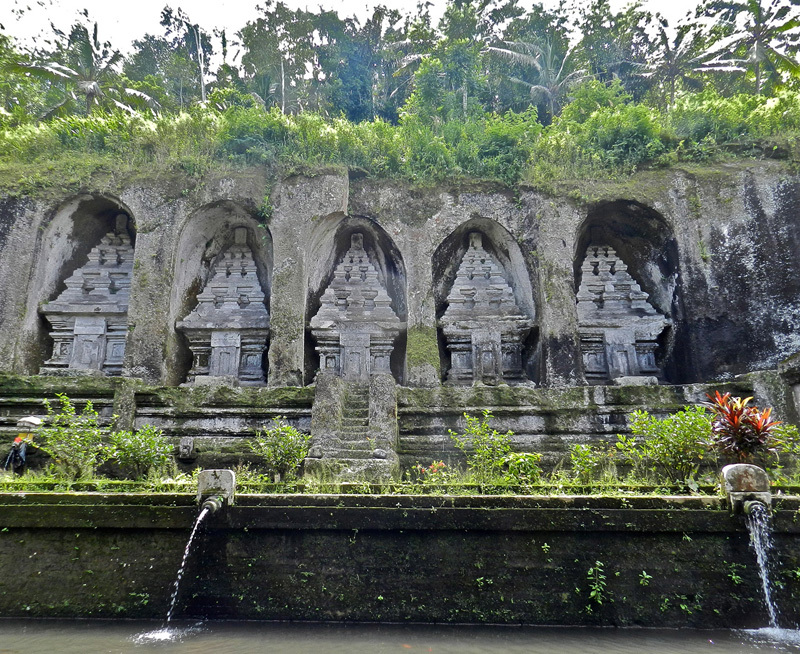 Driving further north we came to an ancient temple/shrine carved into the cliff side. 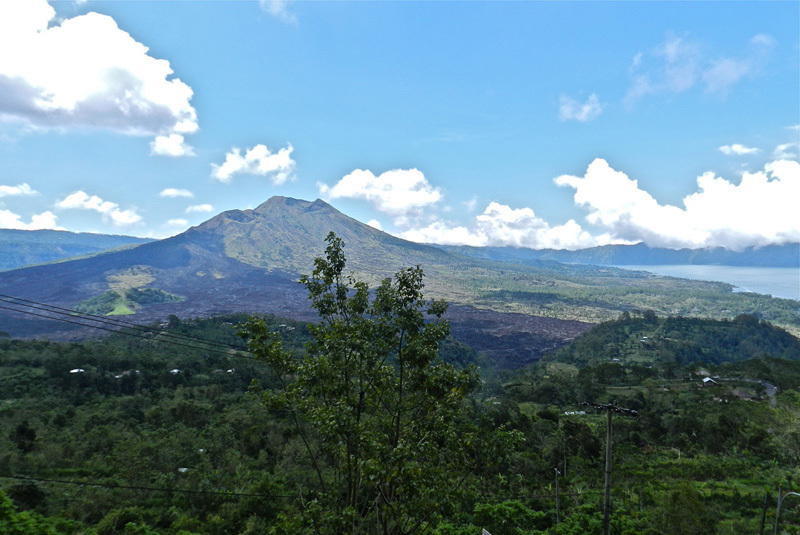 We then went to Batur Temple a short distance away. 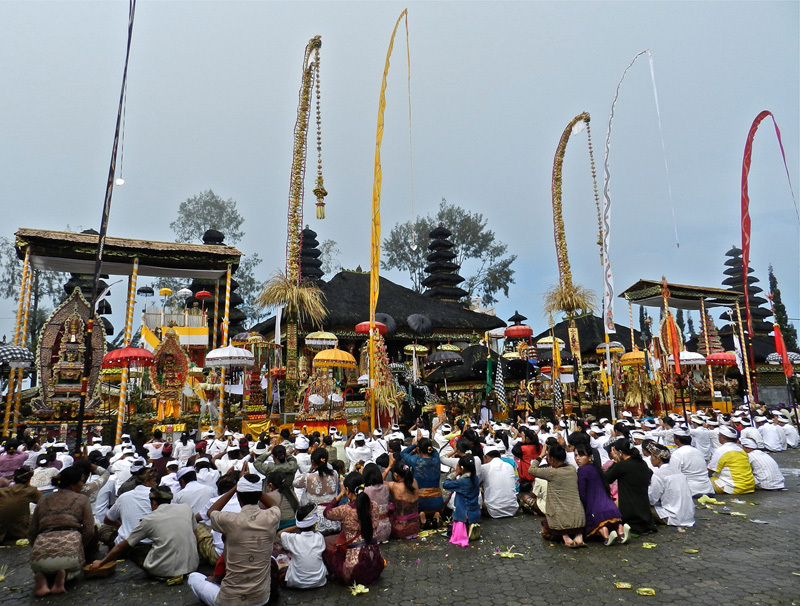 A major annual two week long ceremony was taking place. 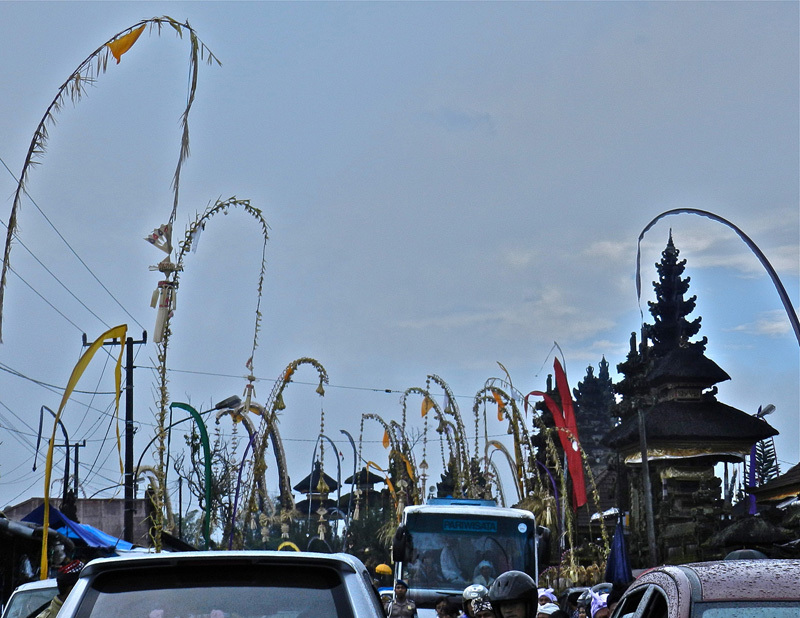 The street leading to the temple was filled with penjors (bamboo poles decorated with coconut palm leaves). 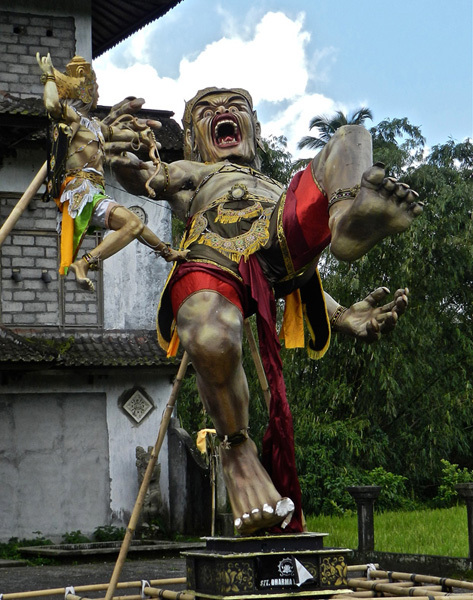 They symbolize the dominance of good over evil, as well as being an offering of thanks, and symbolic of Mt Agung, their sacred mountain. 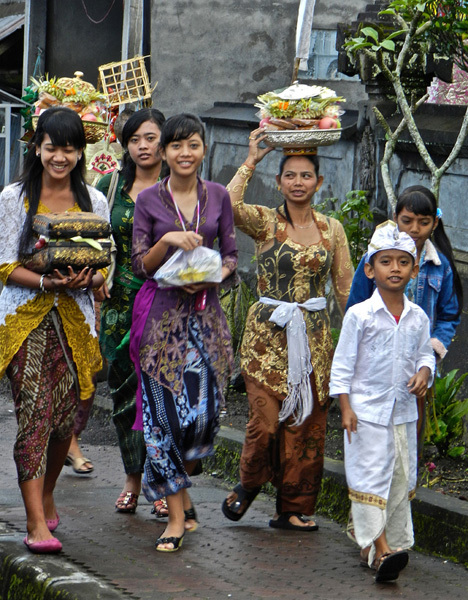 Along with the penjors the street was filled with people streaming towards the temple, the women carrying offerings for the gods and food to be blessed. 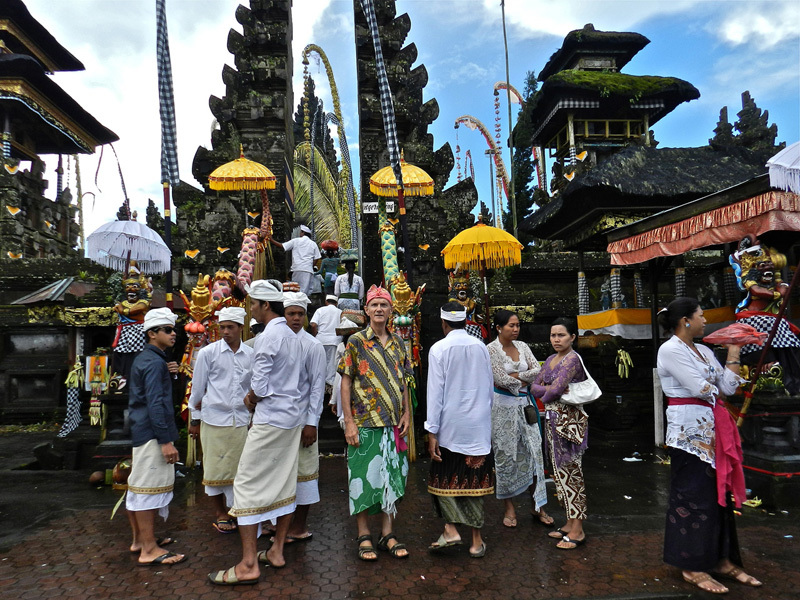 Our guide encouraged us to enter the temple and showed us where we could borrow sarongs, sashes, and a hat for Don. By this time we were both completely awed by the intricate and beautiful decorations, the activity, the gamelan orchestras. What wonderful energy and atmosphere. Then we peeked into the inner courtyard not sure if we could or should enter or not, but we were beckoned in. 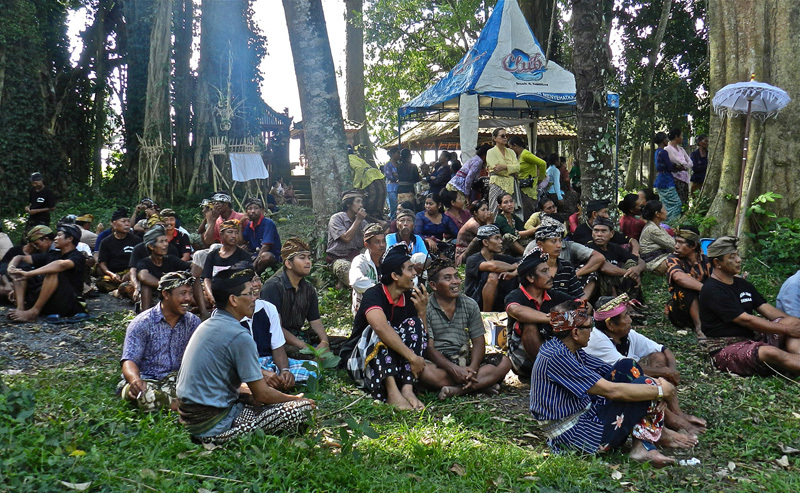 Once again the Balinese openness and willingness to share their culture was demonstrated. So in we went. I hardly know how to describe what happened next except to say we both started crying, completely moved by the full force of the sacred energy. Hundreds in common purpose and prayer, hundreds in intentional connection with the divine. 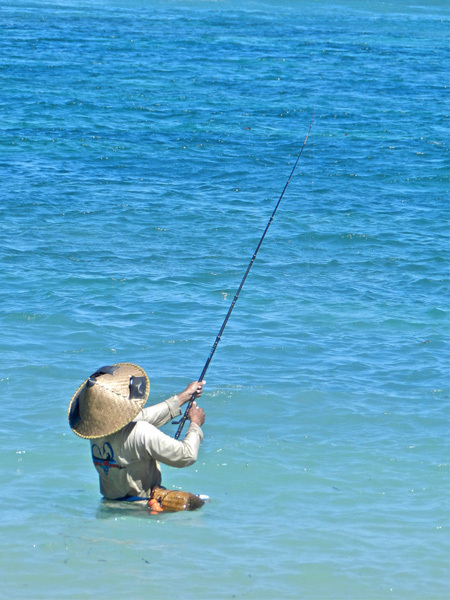 The devotion was so palpable it transmitted itself to us, and we were swept up in it. So moving. I can’t say I’ve ever felt anything quite like this in any of the great cathedrals of Europe. We stayed there for about an hour just soaking up the energy, and did a little meditating/praying/offering-of-thanks of our own. How lucky to have been able to be a part of that. 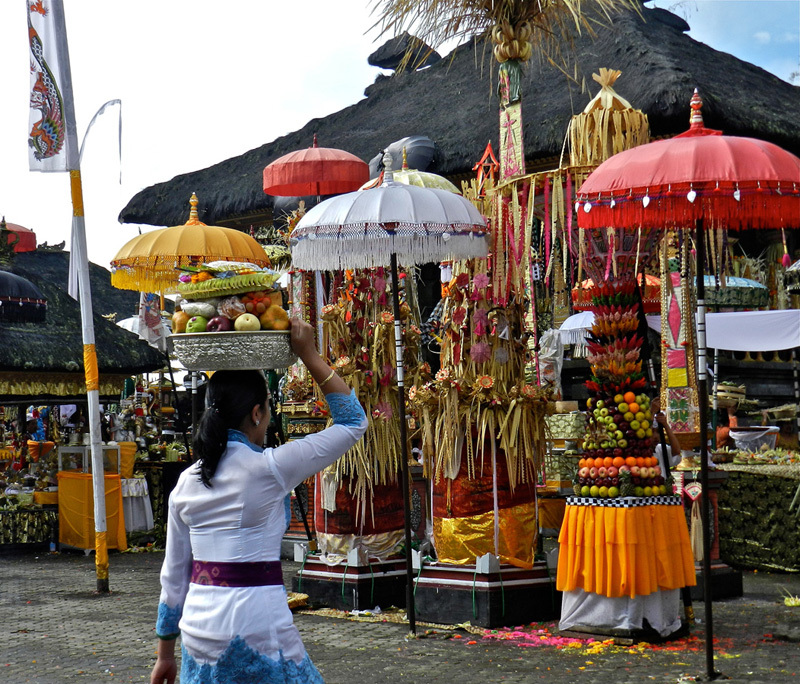 Again we got to see how big and colourful the Balinese do ceremony and ritual. And how committed they are. And lighthearted. 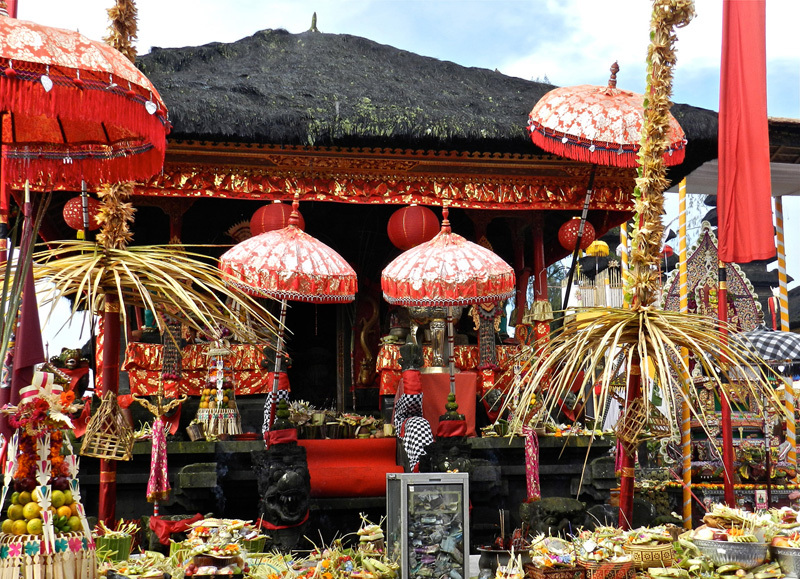 Over the two week period every Balinese family will make their annual pilgrimage to either Batur Temple, or Besakih (the Mother Temple) to offer prayers and thanks to their ancestors, and their Gods, and the Temple itself – in big, colourful, serious, and playful ceremony. A new day. 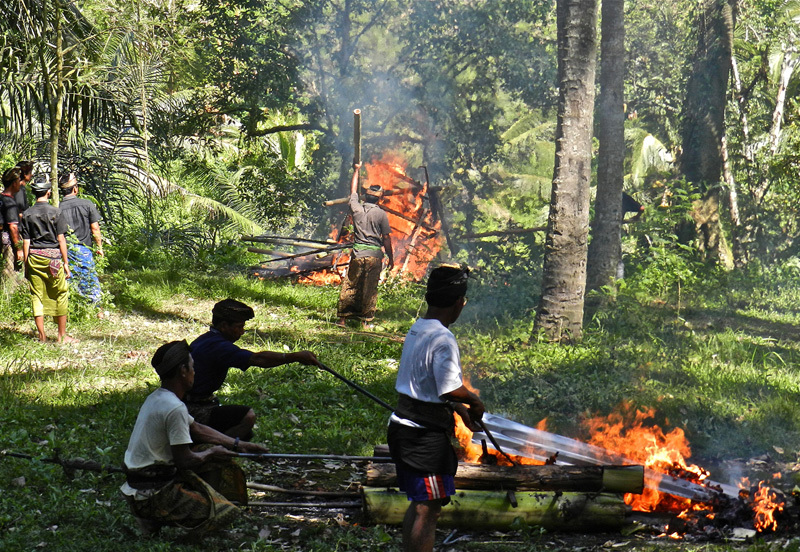 Our wonderful guide took us first to a village cremation. The body is carried to the cremation site in a beautifully decorative bier, especially made for the occasion. 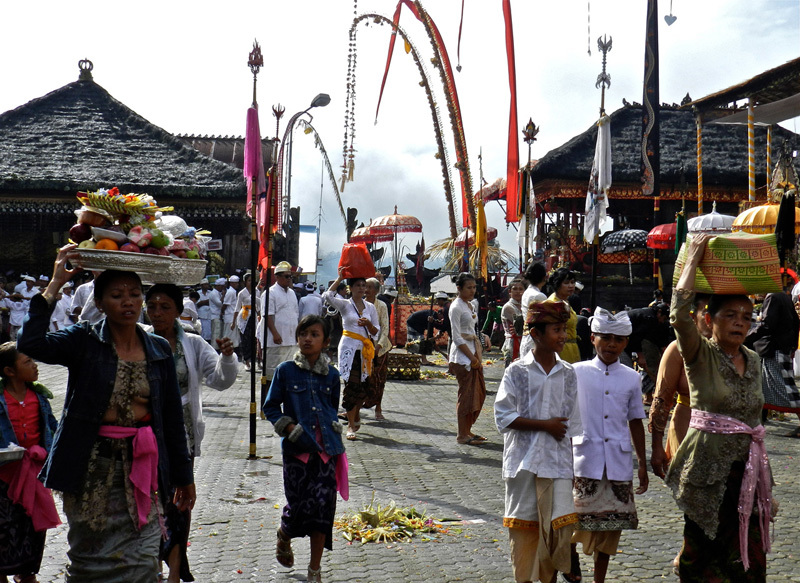 Many of the villagers (at least one man and one woman from each household) follow in procession behind it. 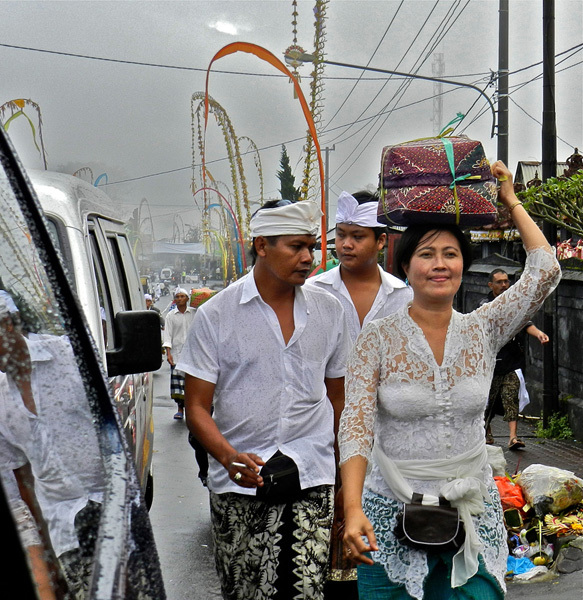 We drove all over the narrow, winding back roads of Bali that day and during the course of the day came across four other funeral processions, the villagers walking down the street behind the bier as it was carried to the cremation site. 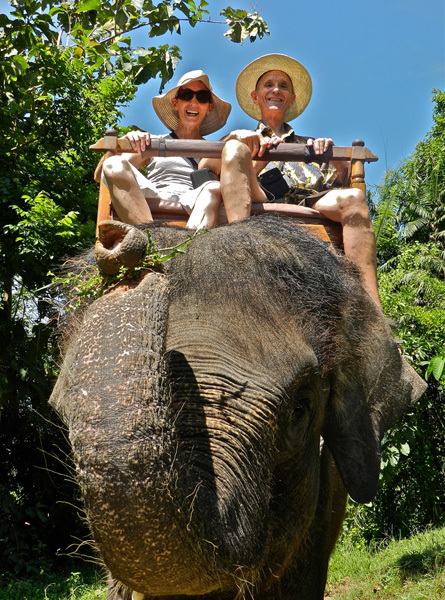 We went for a ride on an elephant! What fun! We had both done it as children, Don at the London Zoo and me at the Melbourne Zoo a kagillion years ago. It was so much fun to do it again. We were like a couple of five year olds. 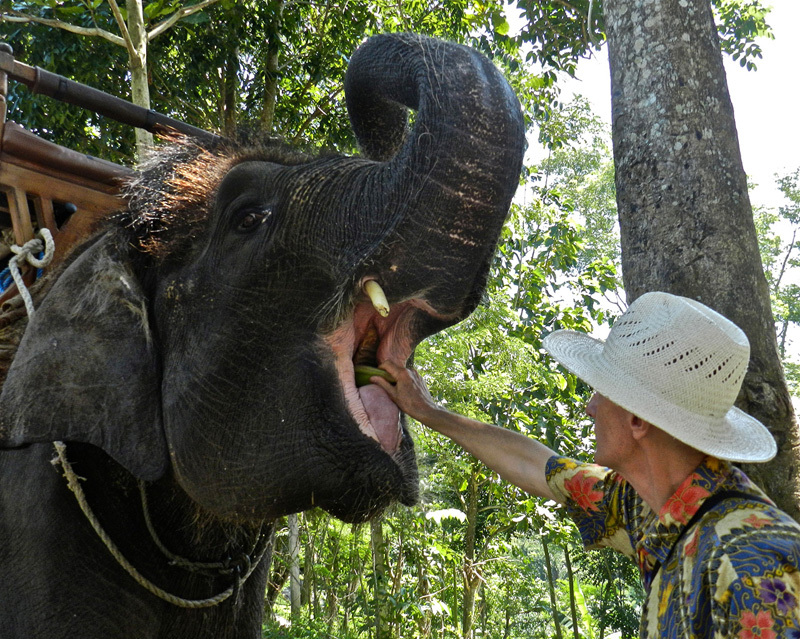 The ride lasted for about a half hour through the jungle and then through a pool of water so the elephant could spray itself. And us! 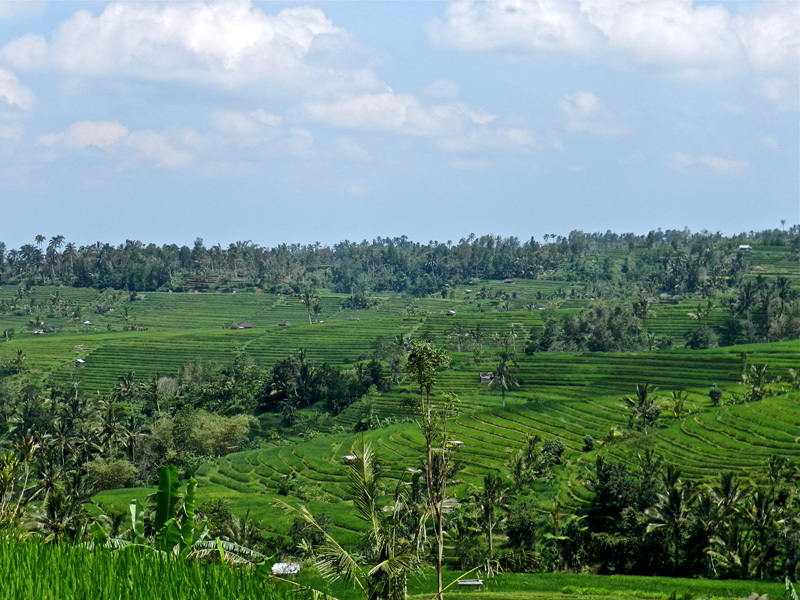 And then we drove and drove, north and west through the narrow twisting back roads of Bali, past villages and rice fields, until we came to a vast expanse of rice fields and a lovely open air restaurant with a fine view where we had lunch. 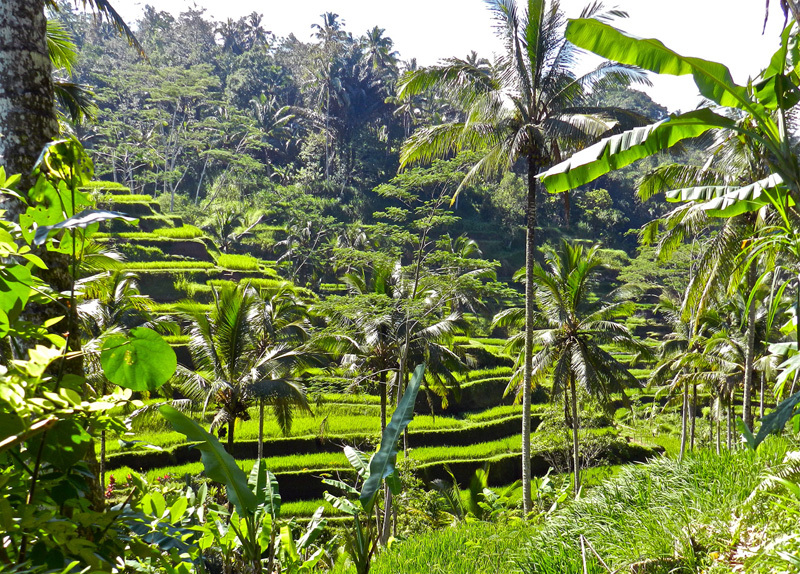 And then a leisurely drive home to Ubud. Another evening of dance, this time three young girls dancing the Legong Dance, followed by a different version of the Barong Dance. Wonderful characters, wonderful evocative dancing and acting. 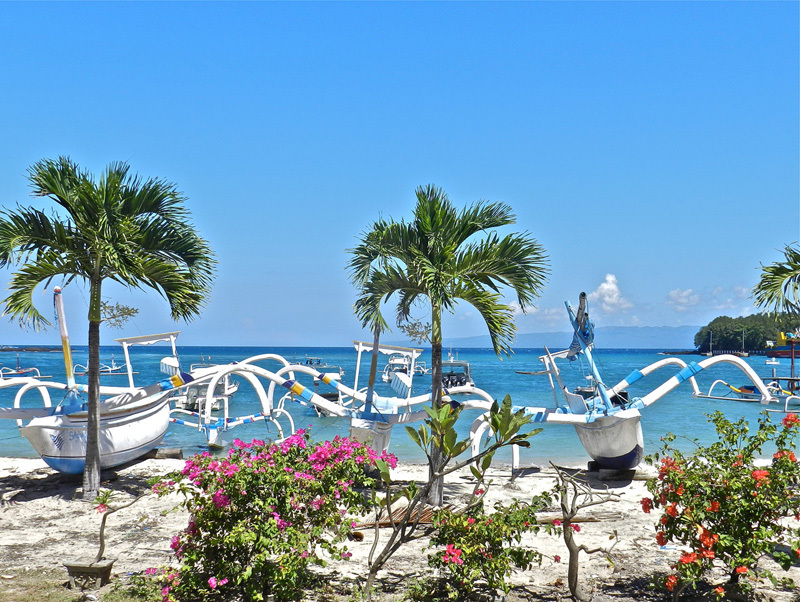 It didn’t remotely matter that we had no idea what was going on, it was all so colourful and vibrant. 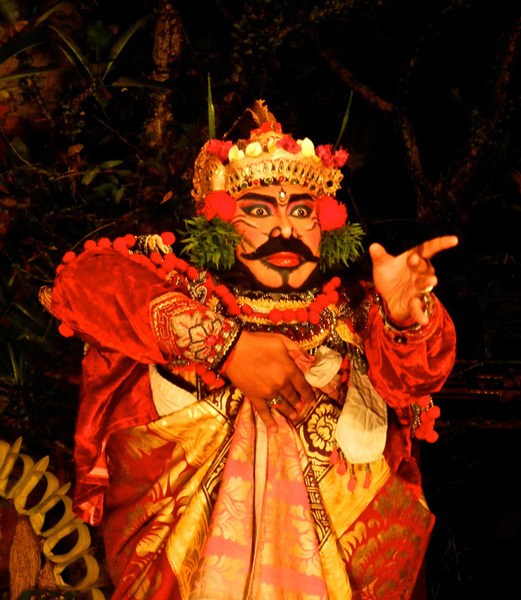 And the gamelan orchestras play throughout and are quite amazing. Gamelans, which are a kind of xylophone I guess, plus a simple stringed instrument played with a bow, plus drums, bamboo flutes, cymbals and a huge gong – it was very noisy. 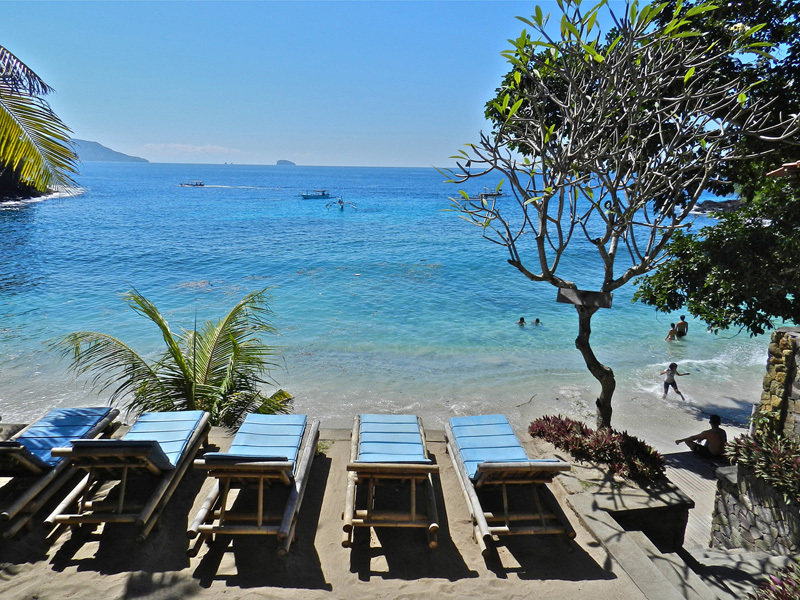 Next blog: Ceremony at Besakih the Mother Temple, snorkeling at the second best place in Bali, and climbing a volcano in the dark! 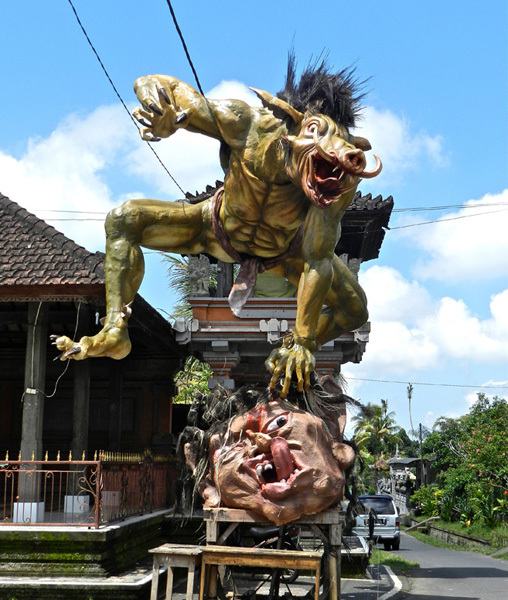 I love looking at those huge papier mache sculptures, the Ogoh-ogoh. I can't help but wonder — if they make these as a way of ridding themselves of certain aspects of their lives, does each type of figure represent some specific issue or thing or maybe a certain category of things? I mean, they do look like there's thought put into the symbolism of each one, rather than just thinking up some cool demonic design for them. Do you know? 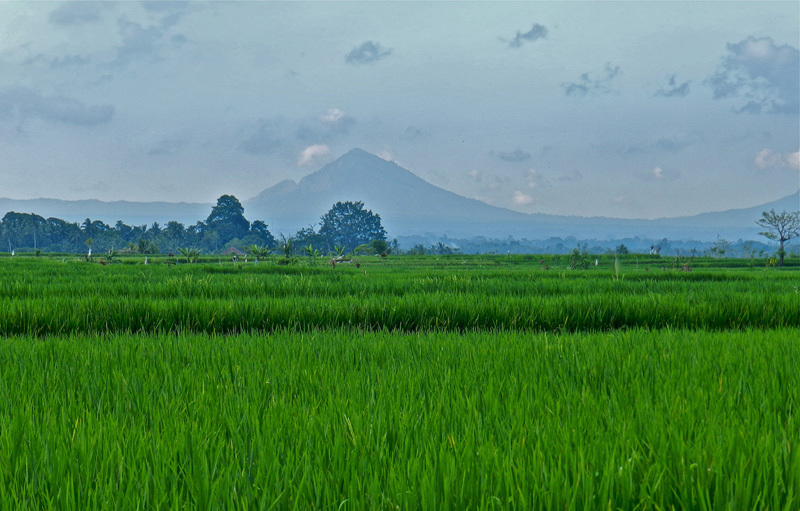 Hello Gede Prama. 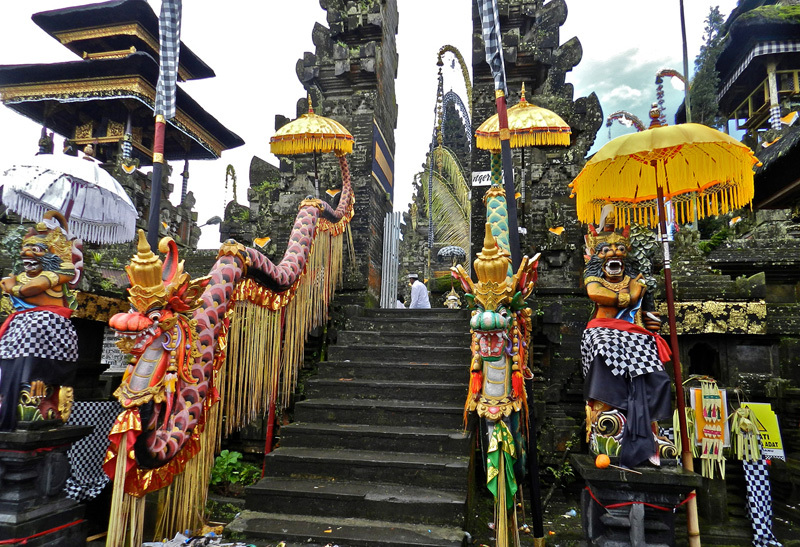 I am very pleased to meet you and very honoured that you like our postings on Bali. Thank you. 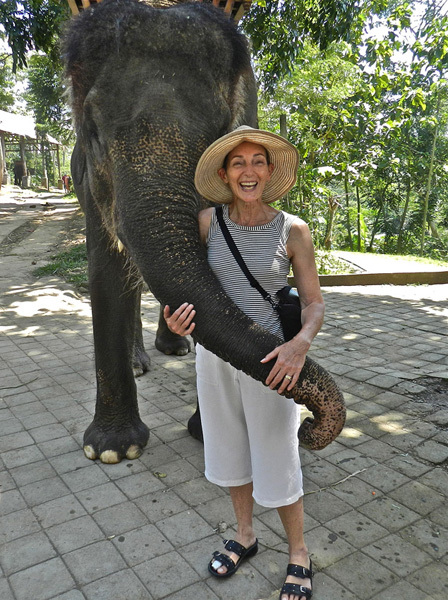 Bali is a very special place. I have been looking at your website. 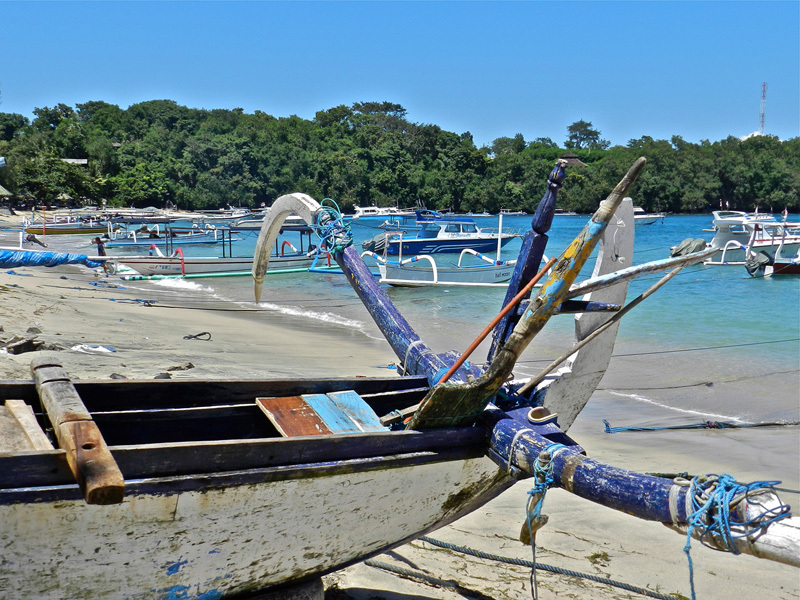 We will probably be returning to Indonesia in early 2015 and will seek you out to meditate with you.